On September, 30th 2016 around 1:41p.m., Kalamazoo Public Safety Officer Tim Millard responded to the 100blk of E Kalamazoo. A citizen had flagged down a Public Safety Officer to advise them they had observed an individual wanted on outstanding warrants in the area. Officer Millard was able to locate the individual with outstanding warrants and take him into custody without incident. A search of the suspect yielded a .22 rifle with the stock sawed off concealed in the suspect’s pants. 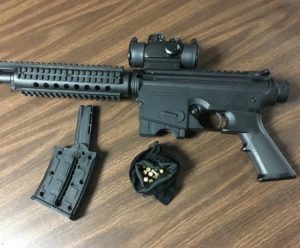 The suspect, a male in his twenties, was arrested for carrying a concealed weapon, felon in possession of a firearm, possession of marijuana, and warrants. Kalamazoo, MI: On 9-13-16 at approximately 4:00 AM, KDPS dispatch received a call from a person who advised that a subject had just pointed a gun at him. The caller went on to give a description of the suspect and the area where he was last seen. Officers went to the area and began looking for the described suspect. PSO Vosburg located the suspect in the 500 block of Lawrence Street. As PSO Vosburg was watching the suspect from a distance, he observed the subject reach into his waistband and drop something. Additional officers moved into the area and the suspect was detained. During the investigation officers located a loaded firearm that he had discarded prior to being contacted. The suspect was identified as a 40 year old Kalamazoo man. 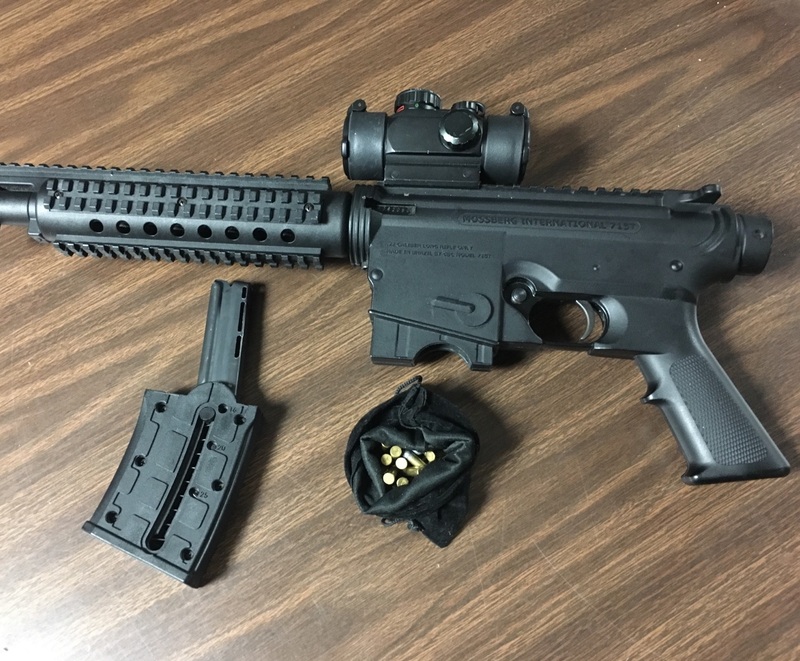 The suspect was arrested for Carrying a Concealed Weapon, Felony Firearm, Felon In Possession of a Firearm, and on several outstanding warrants. He was lodged at the Kalamazoo County Jail awaiting arraignment. Kalamazoo, MI: On Wednesday, 12-30-15, at approximately 4:30 pm Kalamazoo Public Safety Officers spotted a stolen vehicle. After two police K9 deployments two suspects were safely taken into custody. Kalamazoo Public Safety Officers were on the lookout for a stolen car, Ford Focus 4 door, that had been taken from a construction site downtown on Tuesday 12-29-15. The vehicle was spotted initially on North St. and a traffic stop was attempted. The vehicle, occupied by four suspects, sped off but quickly crashed on Simpson St. All four occupants / suspects fled on foot after the crash. Officers quickly secured a four block perimeter and police K9 was deployed. Two of the four suspects (the driver and front seat passenger) were found by PSO Heyduck and K9 Ike after tracking both of them to separate garages. Both suspects, juvenile males (13 and 14 yrs old), Kalamazoo Residents, were arrested without further incident. Arrests were made for various felony charges. Two young males are still at large, anyone with information about this incident is asked to contact Kalamazoo Public Safety at 337-8994 or Silent Observer at 269-343-2100 or www.kalamazoosilentobserver.com.